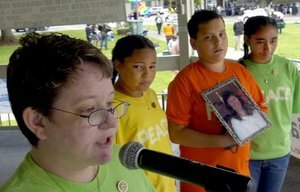 They had been together for 18 years and had three adopted children, but neither that fact nor the legal documentation presented to the hospital (living wills, advanced directives, and power-of-attorney documents) was sufficient to allow 39-year-old Lisa Pond to have her family at her bedside when she was dying at the Ryder Trauma Center at Jackson Memorial Hospital in Miami. Janice Langbehn was finally allowed a five minute visit, by herself, as a priest administered last rites to her life partner. Later, Lisa Pond’s children finally did get to see her — she didn’t know that, however. After she had slipped into an unconscious state that she would never awake from, they were allowed a visit. They all, no doubt, told her during their visit that they loved her and all, no doubt, cried and, as children do, they no doubt begged her to get better. It’s a shame their words fell on deaf ears; a shame that Lisa Pond could not reach out her hand and reassure them. Ten and a half hours later, Lisa Pond was pronounced brain dead. Idiocracy. We are living in a decapitated society. I wish healing and love toward the surviving FAMILY. The stupidity actually starts from not allowing friends and loved ones not related by law or blood to stay with you at the hospital. Not everyone has close family. With all due respect for the opinion of others, I also have my own. I suspect that this case like so many others isn’t about human feelings so much as it is about agenda. We that are not homosexual are constantly under siege to better the social plight of the the Gay and Lesbian population. Any disagreement with their agenda is to welcome scorn and ridicule as was demonstrated in the recent attacks on Miss California. With respect back to you for your opinions I have to say that there are extremists on all sides of every issue. On this issue there are homophobes on one side (the ones who hate and act out against gays in general for being gay) and there are radical gay activists on the other (the ones who have the “agendas” and who make trouble for people because they oppose those agendas). I am neither gay nor am I an extremist on either side but I believe that discrimination, by individuals or especially by the government, against an individual because of his or her sexual orientation is dead wrong, un-American, immoral and stands in opposition to all Christian principles. If you consider the gay quest for nothing more than equality under the law (as was illustrated in this story) as an attempt to “better the social plight of the the Gay and Lesbian population” I would have to respectfully suggest that you are not behaving like a fair-minded person. As Samuel says, the restrictions on visitation are cruel and probably not justified. “Family only” serves no purpose; if you love someone (regardless of sexuality) you should be allowed to see that person. The patient ought to be the one to designate who can, and cannot visit. Barring that, the holder of a valid durable power of attorney. I think that this strikes at the heart of what bad law is. Marriage, as we understand it, is sanctioned by religion, which our government is supposed to stay out of. In order to be married, one must obtain a marriage license. Now, understand that a license is issued to permit an activity that would otherwise be illegal. Following this logically, it seems that it is illegal to get married without the sanction of the state. Prior to Jim Crow laws, all marriages in this republic were common law. You and your betrothed went to your pastor, you had witnesses to the ceremony, and you were married. End of story. Jim Crow laws established that if couples of different races wanted to marry, they had to get special dispensation from the state, a license. It was called “intermarrying,” and said as much on the license. Find your parents’ or grandparents’ marriage license and see if it does not contain the word “intermarry” on it. I don’t think marriage licenses include that term any more, but some jurisdictions may still do it. What then, was the purpose of obtaining a license to “intermarry” if the couple were of the same race? Intermarrying is certainly not high on my list of wise things to do, but I also recognize that it really isn’t any of my business if two people from different races decide they want to be married. So, how did we come from the objectionable practice of licensing intermarrying to the objectionable practice of licensing all marriages? As far as I am concerned, and I’d bet my next paycheck that our founders would agree, marriage is certainly covered by both the 9th and 10th amendments. As such, the federal government needs to find something more important to do than attempting to regulate yet another activity that free moral agents are quite capable of handling without the “assistance” of the state. And for that matter, the states would be well advised to stay the hell out of it as well. Since marriage is really a religious practice, if the pastors do not wish to sanction homosexual unions, that too, is the business of the various churches, not the government. We have become so indoctrinated with the idea that the state must sanction everything that we have lost sight of the fact that we are freeborn, that we may come and go as we please (so long as we do not quantifiably injure someone). Deathbed squabbles between relatives and friends are as old as civilization, and we have always gotten through them. People are prone to irrationality when a loved one nears the end. It would certainly make things easier to have Papa Smurf preside over such occasions, but is it really better? Great points! I totally agree with you. I had heard once that the only reason the government got into the marriage license business was to prevent interracial marriages — I had since forgotten about that; I’m glad you brought it up. As I wrote previously in Gay Marriage, I’m not against it for the simple reason that it doesn’t hurt me or other people, and it makes a few folks happy and helps them have better lives. What could be wrong with that? Yes, Janice Langbehn undoubtedly has an agenda. So what? If I were in her position, I’d have an agenda, too. First, I would be determined to help ensure that no other family has to go through that kind of torture again. Second, I would want to do my part to help others like me overcome a major obstacle in their lives. As for intrusive government licensing for the normal things in life like getting married, that train left the station long ago. It’s not going to change. About the only thing government is reluctant to license and properly control is handguns, but I guess that’s another soapbox for another day…. As I pointed out in my first comments, I was voicing my opinion because Harvey was apparently agreeing with the feelings put forth in the article. I felt that the people involved were being used during their time of grief to strike a blow for Gay Rights. Quite frankly , we all know that if the hospital had been told that the women were Lesbian mates, the problem would have been solved on the spot. However the choice was made to make an issue of it and in doing so gain attention of the media. Patients have a right to privacy and should also have a right to have the companion(s) of choice beside them while ill or dying without regard to defining family/sexual orientation/personal preference/race/age/etc. Well said, Brian. I agree on the gist of what you’ve said. This is a subject that I’ve written fairly extensively on. I don’t claim to be an expert nor do I claim that my research was exhaustive. But… my understanding is that the impetus for the government getting involved in the marriage business was because it offered a seemingly ideal way to regulate the transfer of assets upon the death of the owner – namely the transfer of any SSI benefits. Which is to say that it was wrapped up in taxation of one form or another. Personally, I advocate the government getting entirely out of the marriage business. Leave that to the religions from which it came. The government could issue and regulate Civil Unions which would accomplish the original goals without playing religious referee. That would also leave religious institutions free to apply whatever restrictive rules they wish in order to win their formal sanction over the Civil Union. Religious conservatives would have been smart to pursue this a decade ago. As it stands now that window of opportunity is quickly vanishing and sooner or later (my money says it’ll be sooner) their religious sects will be forced to indirectly recognize gay couples being “married” and they’ll have nobody to blame but themselves. Yes I most definitely do agree with the feelings put forth in the article! No question about that! I agree that a person should be allowed to have their family (whoever HE or SHE considers family) with them when they are dying. I agree that rules and laws that specifically eliminate gay couples from the definition of family are outrageous and should be changed. Those, as I see it, are the two dominant “feelings” expressed in the article and I enthusiastically agree with both. Yes, the people involved probably WERE being used by the media to strike a blow for gay rights! The media uses anyone and everyone who can help them gain an audience. I have no problem with that! Personally, I think the only thing wrong with Gay Rights is that Gays don’t have enough of them. I have no idea where you got your observation that: “we all know that if the hospital had been told that the women were Lesbian mates, the problem would have been solved on the spot.” I for one don’t know that or believe it. That, in fact, sounds like a headline in the National Enquirer: “Gay Hospital Workers Mistakenly Deny Access to Gay Mate”. Sorry Larry if it seems that I’m attacking you — you have the absolute right to your feelings and opinions and I’m glad you expressed them here. I disagree substantially and tend to voice my own opinions very strongly in response. That’s what we’re all here for. Why are there regulations about visitation in the first place? Surely a doctors / nurses discretion (in the case of an uncommunicative patient) would suffice. One of the things that patients should do (and it sounds like these folks did most everything they could to have the patient’s wishes honored) is have conversations with their doctor about their end-of-life wishes. In my paying job, I work for Compassion & Choices, an organization that advocates for end-of-life choice. On our homepage you’ll see a link for A Letter To My Doctor. The letter can easily be used as a template to create your own in order to begin the conversation with your physician. Carla, it does sound like they had all the documents that should have been necessary. But apparently not. The link you provided to the sample letter is excellent. I think everyone would be well-advised to have such a letter on file with their physician. Personally, I have something very similar, and if it isn’t honored when the time comes, I’m going to haunt those who ignored it! Hospitals get entirely too power hungry. My father in law died alone because the hospital would not allow his son into the intensive care unit because visiting hours were over. There was a fight that followed and security had to remove my ex-husband. They don’t allow anyone not related by blood to enter intensive care except husbands and wives, in my experience. Soon we will all have to carry our birth certificates into the hospital to visit — ridiculous. Life partners should be allowed the same rights as spouses, no excuses. Doris, there are some legitimate medical reasons to restrict visitation in an ICU. Many of the patients need severe restrictions on any form of stimulation, even from a passing visitor to another bed that may only be one or two beds away. In addition, more bodies floating around the ICU mean more distractions for the nurses working there. Intensive care is just that – the close scrutiny of an educated, trained, and experienced nurse who focuses his/her attention on 1 or 2(at most) patients. A distraction of 30 seconds or a minute can be the difference between life and death.